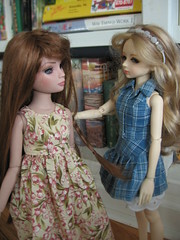 Ciara (pronounced Keer-ah), was my first ABJD (Asian ball-jointed doll), and, over twenty BJDs later, she’s still my favorite. Ciara arrived at my house on Valentines Day of 2008. On the right is an image from her box opening. 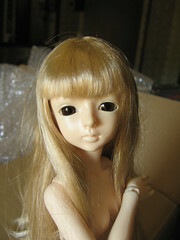 She came to me as a basic doll with no wig, painting, or clothing. All she had were these dark brown eyes. In this picture she’s wearing an Essential Ellowyne wig. 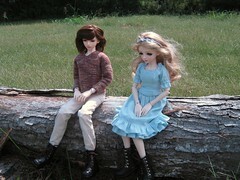 It often takes me a long time to get dolls painted, clothed, and named. 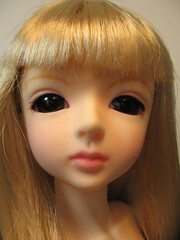 Ciara still didn’t have a name when she got her first faceup. It wasn’t until my second try at painting her face that I was comfortable enough with the results to come up with a name for her, and she became Ciara on March 26th. The face she’s wearing now, seen in the photo at the top of this post, was done a year later. Ciara wears a modacrylic “Ginger” wig, size 6-7, in color Golden Strawberry/Chestnut Brown, and 14mm blue glass eyes from Latidoll. 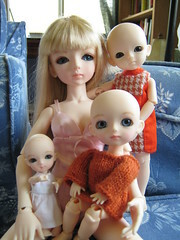 It wasn’t long before I started dreaming of more BJDs, and Latidoll totally had me. As Ciara’s personality started to develop in my head, I realized that she had a whole family of sisters who needed to be adopted! As it turns out, seventeen-year-old Ciara is the oldest of six orphan girls. She’s shy, quiet, and sensitive. In Jane Austen terms, I supposed I’d call her a Jane Bennet. It’s been up to her to take care of them, along with her ten-year-old sister Dana. Ciara came over to this country alone to find work and hopefully earn enough money to bring all of her sisters over to live with her. Blythe world by storm and she was able to make enough money to bring over all her sisters in less time than she ever would have dreamed. Today what seems to interest Ciara most is Dillon Kincaid. Coming from the same, poor country is something they have in common. Dillon was living in the same apartment building as Ciara, but they hadn’t met until he brought her one of her little sisters who went missing on the trip over. Later, Dillon revealed the secret that he, too, had siblings in the old country–only he didn’t know where they were. Then began the drama of finding the boys and reuniting them with their older brother. Image from the "Waiting for Latis" video. Ciara has been very supportive. Don’t tell the others, but Ciara and Dillon are definitely a couple. However, letting all the other dolls know would put an end to all the fun they have teasing them and scheming to get them together. 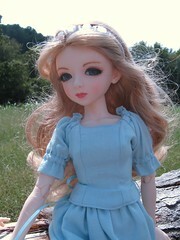 This entry was posted in BJDs, Doll Profiles and tagged abjds, ball-jointed dolls, bjds, dolly delicacies, lati blue, latidoll, shaina, susan bischoff. Bookmark the permalink. I have a Lati Blue Yern. I would love to know if you know of where to find proper shoes for these girls. Their feet are 5.3-3cm and most shoes are either too big or too small! I’m sorry to say that I have a barefoot crew. (And a lot of them are bare-faced as well.) We’re really shoe poor around here. I have one pair of nice boots that she wears when we go out (that most of the girls share). I’ve always planned on learning to make shoes, but you know how that goes… Nowhere fast.